This Garlic Shrimp Stir-Fry with Peppers & Onions was a hit for two people in my house, Mr Magpie and I. 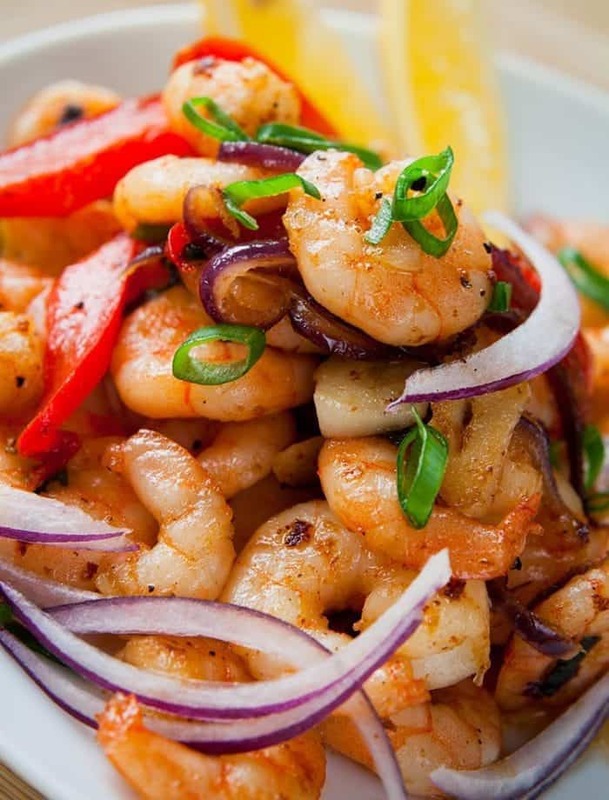 Why oh why can’t I get my kids to like shrimp? They have been SO game to try it, they have. They’ve taken bites and tried it many times, but I just can’t get them onto the shrimp train. It took me years to get MIKE on the shrimp train, never mind the kids, so maybe I am just being impatient. I don’t get it because I have loved shrimp for as long as I can remember. My mom has always been a shrimp lover and used to make shrimp dishes when we were kids, and I always ate it. Granted, it’s taken me years to get Mike onto the shrimp train as well. He developed a dislike for a lot of seafood when he was a kid and I think when that happens, you have to try, try again as an adult. With me it was cilantro. Oh, when I was in my early 20’s, a restaurant overdid the cilantro in some wraps of theirs. I took one bite and it was SO BAD that I didn’t touch cilantro for another 15 years, no word of a lie! It has taken me this long to start eating it again within the last 3-4 years. Now I love it and can’t live without it. This garlic shrimp stir-fry was a good way to help him along his shrimp-loving journey. He started with popcorn shrimp ( of course, I mean, you can’t even taste the shrimp) and has now started enjoying shrimp fairly plain. It’s a miracle! But really, a simple garlic stir-fry with fresh vegetables is a good basic recipe. It’s not fancy, it’s just delicious. Has anyone else developed a new love for an old hated food in their adult years? Pin this to your dinners or healthy recipes boards and Follow Me on Pinterest! This Garlic Shrimp Stir-Fry with Peppers & Onions is fresh, fast, healthy and seriously easy to make! Add snow peas if you are a fan of them, but it's delicious without them! If wanted add in 2 cups of fresh snow peas with the vegetables. Prepare your rice of choice. In a large skillet, saute the garlic in butter for 2 minutes. Add the shrimp, peas ( if using), red pepper, onion, basil, salt and pepper. 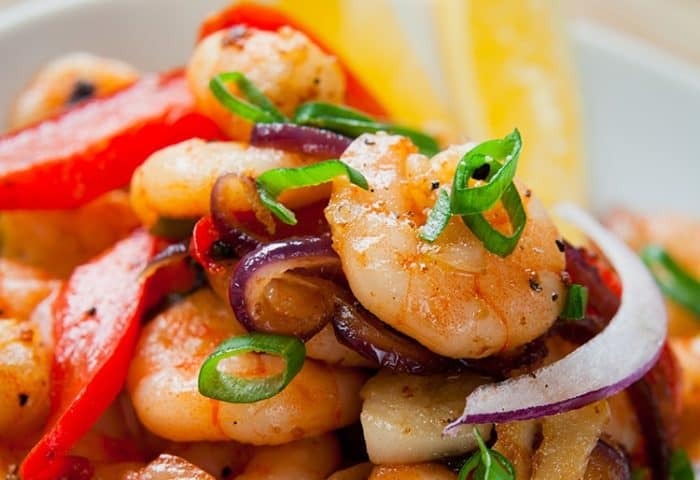 Stir-fry for 5 minutes or until the shrimp turn pink and the vegetables are crisp-tender. Add the chicken broth. Cook for 1 minute longer or until the broth is heated through. Add the green onions and toss slightly. Nutritional value is without the rice added.